Amalgamation is desirable without delay. It will be proposed to the C[entral] C[ommittee] of the RSDLP to include forthwith a Mezhrayontsi representative on the board of each of the two newspapers (the present Pravda, which is to be turned into an all-Russ[ia] popular newspaper, and the CO, which is to be organised in the immediate future). It will be suggested that the C[entral] C[ommittee] set up a special organising committee to convene a Party congress (in one and a half months). The inter-regional con[ference] will get the right to have two delegates included in that committee. 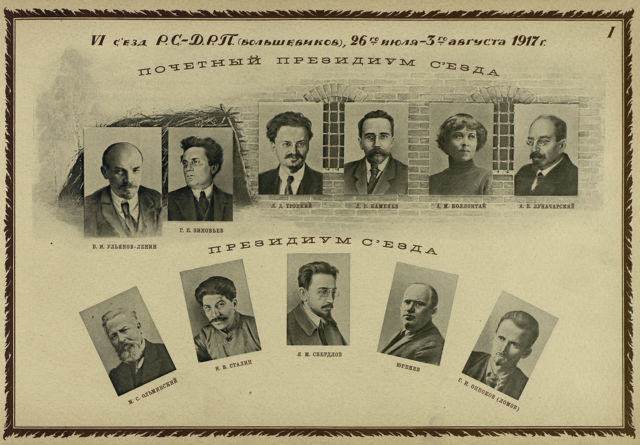 If the M[enshe]viks, supporters of Martov, break with the “defencists”, the inclusion of their delegates in that committee is both desirable and necessary. Freedom of discussion of outstanding issues is ensured by the publication of discussion leaflets in [Pravda] Priboi and by the free discussion in the journal Prosveshcheniye (Kommunist), which is being revived. (May 10, 1917)** Lenin in his own hand.—Ed. I agree with the resolution as a whole—but only insofar as Russian B[olshev]ism has become international. The Bolsheviks have been debolshevised—and I cannot call myself a B[olsh]e[vi]k. Their resolution can (and must) be used as the basis for the qualiﬁcation. But we cannot be asked to recognise B[olshev]ism. The Bureau—(C[entral] C[ommittee] + . . . .) is acceptable. Participation in the newspaper—this proposal is “less convincing”. “From that angle it will not stand.” Agreement of individual writers “from a different angle, from the angle of setting up your own newspaper”. . . .
Co-operation (from both sides) is very desirable. . . .
(Discus[sion] organs are unessential). . . . The old factional name is undesirable. . . . They want the nationals to be also included in the “Org[ani]s[ing] Bureau”.